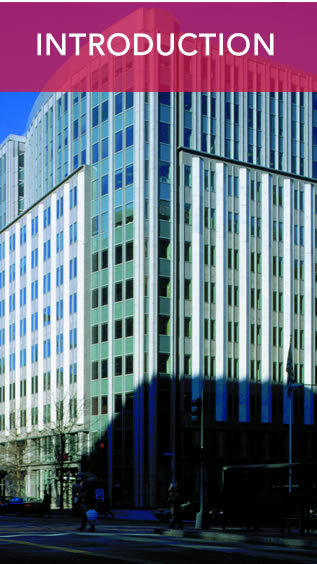 The Millennium Building is a 240,000 SF, multi-tenant commercial office building and is located in the Golden Triangle Business District on the high visibility corner of 19th and K Streets NW. This Class A office building was fully renovated in 1999 and includes an on-site concierge, rooftop deck and herb garden, fitness center, secured state-of-the-art bike room, yoga class, on-site shoe shine service and various engaging programs for building Clients throughout the year. The Millennium Building is a top performer in The Tower Companiesâ portfolio - it achieved LEED Gold Re-Certification under Existing Buildings (EBOM) version 2009 in 2013. The building has also earned Energy Star Certification every year since 2010 and has a current score of 85, meaning that it performs better than at least 85 percent of similar buildings nationwide.